Anyone in the mood for spring cleaning? Steph of Snickerdoodle is here to help you keep it green. Welcome, Steph! Anyone who's been to my house might chuckle to see that I've written a guest blog post on cleaning. My husband and I share our little old house with three small and very dirty (read: happy) boys. There's always a mess being made somewhere in our home. In fact, I don't remember the last time that our house was all clean at the same time. But the benefit of our messy existence is that we've had lots of opportunities to test lots of different natural cleaning recipes and methods. If these cleaners are able to tackle the messes we make, you can know that they work. I don't mean to target Formula 409. A quick stroll down the cleaning products aisle of your grocery store will turn up dozens and dozens of cleaners that are probably effective, but dangerous for our families and the environment. Pick up any bottle and read the label and you're likely to find long lists of strongly-worded precautions and warnings. You don't have to use those harsh cleaners to have a clean home. Did you know that you can make your own household cleaners that are safe, effective, and cost a fraction of what you'd pay for store-bought cleaners? And it's easy too! Once you've got the ingredients on hand, it only takes seconds to whip up a fresh batch. And the best news of all is that you may already have some of these ingredients in your kitchen. I use this all-purpose cleaner for everything: cooked-on messes on the stove, counter tops, crayon marks and grimy fingerprints on my walls, and a great no-rinse mop solution. You may need to give it a little time to work on particularly crusty, caked-on messes. In that case, I usually spray the mess generously, go do something else for a couple of minutes and come back to wipe up the mess. This solution is particularly effective when used with a microfiber cloth. Optional: a few drops of your favorite essential oil(s). Put all the ingredients into a spray bottle, shake it up a bit, and use as you would a commercial brand. The soap in this recipe is important. It cuts the wax residue from the commercial brands you might have used in the past. Microfiber cloths are a great, lint-free, low-waste way to wash your windows/mirrors. Newspaper also works really well. This stuff is great. I've successfully used it on moldy shower curtains and on the mildew that shows up in my poorly-ventilated bathroom. Tea tree oil is expensive, but a little goes a very long way-- and there are lots of wonderful uses for it. (I'm still using a bottle that I purchased a couple of years ago) The smell of this spray is very strong, but dissipates within a few hours. Fill a clean shaker-type container with Borax. 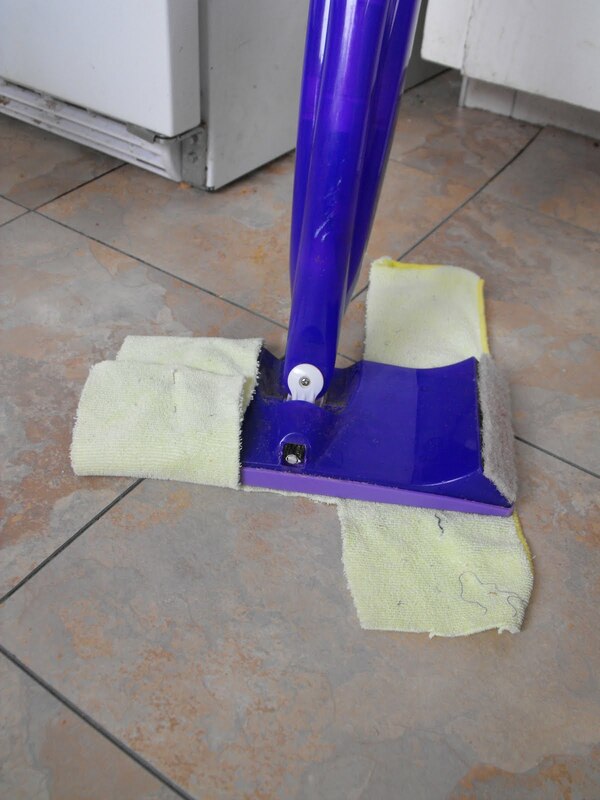 Sprinkle over damp a damp surfaces and wipe with a damp cloth or sponge. Rinse thoroughly. Great for sinks, bathtubs, and toilets. For toilets, sprinkle generously into toilet water, swish with the brush and let sit 30 minutes to overnight. This does a beautiful job removing stains from my 68 year old porcelain kitchen sink. Baking Soda also makes a great scouring powder if you don't need to remove stubborn stains. I have very hard water and inevitably end up with deposits on my faucets and around my drains. For a while I thought that I'd just have to live with it; that that was one area that my DIY cleaners just couldn't compete. I knew that the high acid content in vinegar will eat right through hard water deposits. However, vinegar takes time, and short of filling my bathtubs and sinks with vinegar, I couldn't find a way to apply it so that it would stick around and get the job done. Citric acid granules, however, do the trick perfectly. Just sprinkle some on a damp sponge or cloth and scrub away at your hard water deposits and watch them dissappear! Be careful around metal fixtures-- it may discolor them. And you'll also want to do a spot test if your sink is made of anything other than porcelain-- I've only used this on porcelain and I'm not sure if it would cause problems for other surfaces. Citric acid is safe (it's really just vitamin C), but it's high acidity may irritate skin, so be sure to wear gloves when applying. Hydrogen Peroxide is an awesome, and very safe germ killer. It's great for surfaces that come in contact with food and baby stuff. It needs to stay in its brown bottle though, as exposure to light will reduce the potency. Just borrow a sprayer from one of your spray bottles and screw it on, they should match up. 100% Vinegar is another great disinfectant. I especially love to use it in the bathroom. Perfect for toilets and the walls surrounding (I have boys, remember?) The smell is kinda strong at first, but it will dissipate pretty quickly. Vinegar and Hydrogen Peroxide are both great sanitizers in their own right, but when used together, they're actually more effective than bleach or other commercially available cleansers at killing bacteria, according research done by Susan Sumner, a food scientist at Virginia Polytechnic Institute. Using her method, vinegar and hydrogen peroxide are not mixed together in the same bottle, but rather sprayed one after the other. This combo is effective not only on metal plastic and wood, but also food. That's right, you can spritz vinegar and then hydrogen peroxide on your salad greens to be sure they're nice and clean (with no noticeable vinegar taste, even). Woo Hoo! Shake to combine and use 1 Tbs. "detergent" per load. Pour white vinegar into your rinse aid compartment. I've got an old dishwasher, and like I mentioned before, very hard water. The only way I've been able to get any detergent to work for me is to add the "detergent" to the pre-wash dispenser and fill the actual detergent dispenser (the one with the door) with white vinegar in addition to filling my rinse aid compartment. You may have to experiment a bit to get it to work for you. I'm still working my way through my stockpile of warehouse-sized jugs of liquid detergent. But when I'm through with them, there are a couple of laundry detergent recipes I'm looking forward to experimenting with. This one from Bonzai Aphrodite looks interesting, and so does this recipe via Sutton Grace. And finally, don't let your beloved Swiffer stand between you and saving money and the environment. You don't have to give it up! A couple of modifications will make it a mean, green, cleaning machine. 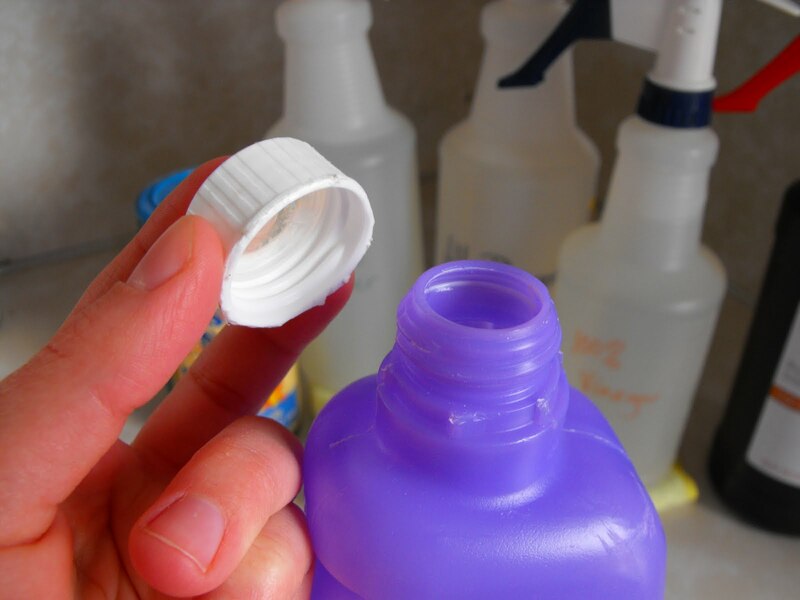 If you look at the cap of your swiffer wet jet bottle, you'll see that it somewhat resembles the cap on a 2 liter soda bottle, except that the ring on the swiffer bottle is fused to the cap. If you carefully cut the ring away (I used an X-acto knive), you'll find that the swiffer cap will screw on and off easy as pie. See how it twists off? Now you can refill it with our all-purpose cleaner! Use that bottle over and over and over again. For the pads, I just cut a microfiber cloth into an "H" shape, and use straight pins to hold it on. The microfiber makes the mop a little harder to push, but it cleans really well. If you wanted to get all fancypants, you could knit your own colorful swiffer pads and attach them with buttons, like this. I'm sure we all look forward to the day when houses will clean themselves, but until then, I hope you enjoyed these green cleaning recipes and ideas! This is perfect. 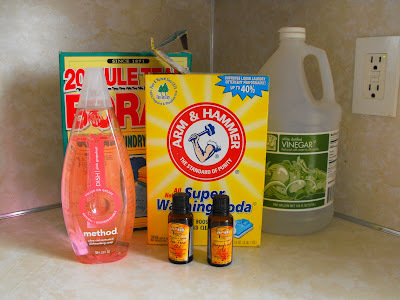 I've been wanting to make the switch to greener cleaners but have been too lazy to spend loads of time researching. Thank you for putting it all in one place! Thanks Steph for posting this! I have been meaning to do this for so long. Maybe I will finally get around to it. Thanks for the encouragement! Steph, thanks so much for the awesome tips. I've been using Simple Green, but I'm not crazy about the scent, so I'm going to try out some of your recipes. first off, I LOVE your blog...I just came across it and am so happy to have found you! second...thanks so much for all this info! I have been using so much vinegar these days....that stuff is crazy what it can do! I'm really glad to be introduced to these ideas. I've honestly never thought of making my own cleaners. Great post thanks so much! Love tee tree oil. It is my staple for battling strong odours! I love this! I have been using a vinegar/water mixture in a spray bottle for cleaning and I LOVE it. But this post has given me so much more info! I LOVE Borax too by the way, it serves so many purposes! I think it's SO smart to clean this way. Have you ever read the ingredients in cleaners? S.C.A.R.Y. I love knowing I can clean and disinfect w/o worrying about potentially harming my family. Thanks for the tips! I wish I'd known it was that easy to remove the lid from those pesky mop refill bottles. Thanks for the tip. Awesome article and great tips! I also make my own cleaning products but I like to add some drops of Citra Solv to them, which of course it's a natural and biodegradable cleaner. It makes them more effective and they smell much better... I hate the sting of vinegar! I was just trying to figure out how to use my swiffer without buying all the stuff they want me to buy! THank you thank you!! Vinegar also makes a great wash for produce. I fill a large bowl with mostly water and add a 1/4 vinegar. I let everything soak for about 10 minutes. I then remove the produce, rinse it off, and let it air dry on clean towels. You'll be shocked at what is lying in the bottom when you're done. Our water is really hard too - I am excited to try the citric acid. Thanks for the tips! Great list! I've tried some recipes similar to yours over the last year in my attempt to make household cleaning less toxic. Looking forward to trying some of these out too. Thanks for sharing! Useful list of cleaners i have ever found..
Nice guide thank you!/ I love it! very creative! That's actually really cool Thanks. I used your post on my blog and just wanted to say thank you for posting this! It is not enough to maintain the cleanliness in your space. 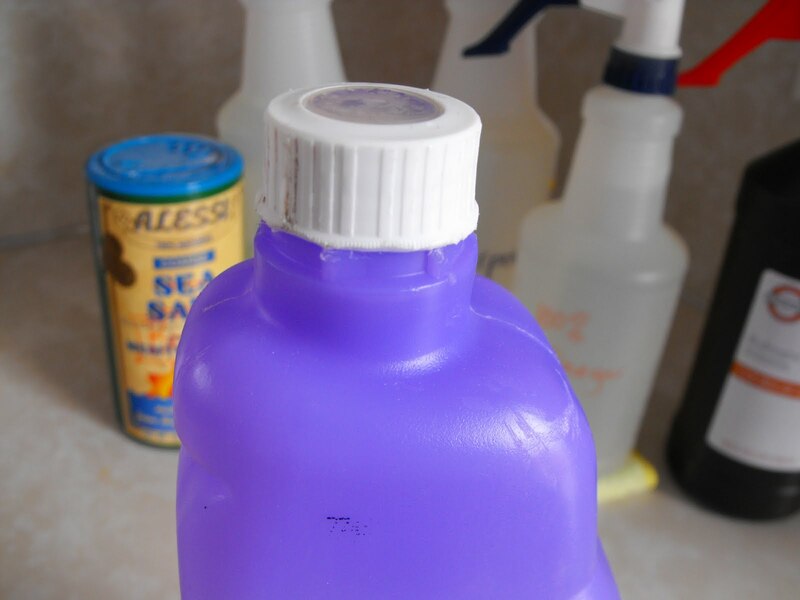 You also have to make sure that your cleaning products are safe and eco-friendly. Using chemical cleaners might affect the quality of your indoor air and have negative effects on your health. Be wise enough with your choices. Surely you have shared some unique and very effective home cleaning methods.. I am trying to satisfy my bond clean terms so the methods will help me lot..
Just a small note: although citric acid occurs naturally in fruit (especially in citrus fruit) it is not the same as vitamin C. Vitamin C is ascorbic acid. So if you purchase food-grade citric acid for cleaning please don't add it to your orange juice thinking you are getting extra vitamin C! How about you combine vinegar with boiling water, detergent and citrus? That should make a powerful cleaning solution that will help get rid of those buildups. And it might work on clogged drainage too, given that only thing that’s causing the clogs on your drain are amassed dirt and grease, and not some faulty piping system that would require more than just DIY solutions. in a spray bottle. The most important being vinegar. Leave this out and it will not clean with the same effectiveness. How about a 'DIY household oven cleaner' added to this blog? I would love to see what you would use in that. I would have some great ideas for that too. Lets see it! Great! I can't wait to try the glass cleaner recipe.All recipes seem to be easy to make and so useful. Thank you for the ideas! 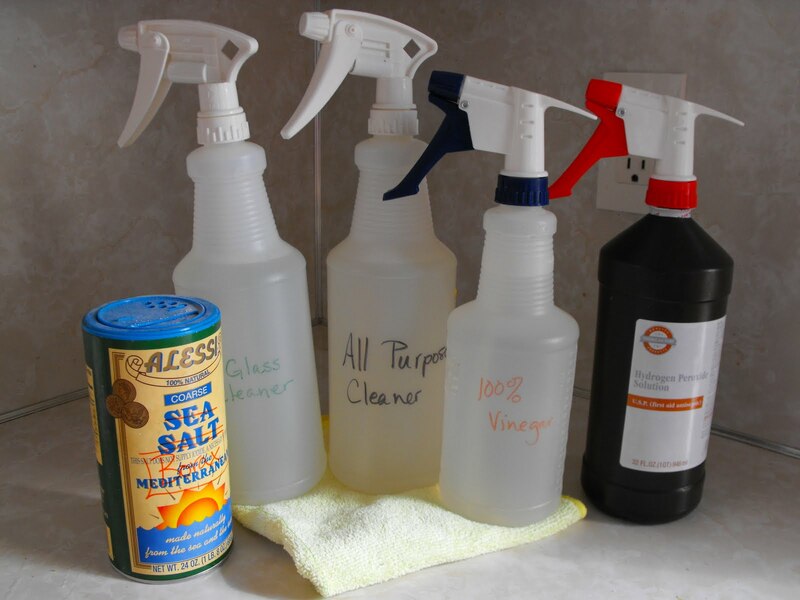 Vinegar is one of my favorite green cleaning products. I'm always learning new ways to use it. Thanks for sharing the great ideas! IPAX Caribbean is a manufacturer of superior quality cleaning products that are environmentally responsible for the industrial and commercial workplace. Our products prove that cleaners can be universal, powerful and safe, without being hazardous. Each IPAX solution is a proprietary formula and the result of careful scientific research and development. IPAX products are of the highest quality and excellence with a dedication to, production quality, Green Cleaning, Environmentally friendly Products, Biodegradable Cleaning, Eco Friendly , Earth Friendly, Safe cleaning , Non- Toxic, Green Seal Certified, Multi Propose Cleaning, Hospital Cleaning , Industrial Cleaning, NEUTRAL DISINFECTANT, application technology, operational performance and human safety. These are some really great ideas, thanks for sharing them with us. I use Maid Complete who are a house cleaning company and leave my home looking great. I'm not sure what products they use but I can never complain, as they provide a high quality service! Really good post, this will help me a lot in the future. I had no idea about this lol. Pretty interesting subject for sure though. You know if you are not on Instagram, you should be. I know you can't put text up, but just throw in a few pics and build an audience there. I think you'd find a ton of people who would be super interested in your blog here. End of Lease Cleaning Melbourne protects bathroom and en-suites cleaning and also laundry, meeting the expectations of the property managers. Whilst the staff are trained and experienced no cleaning job is too large or small for them. Green cleansing product is too good for bathrooms. Thanks for sharing informative post. If you are based in Melbourne and looking for best cleaners to concentrate on your daily task contact Carpet Cleaning Melbourne from Drymaster for professional service. Hello Webmaster first of all Thank you very much this article. I really like your blog, this blog is use full for me. Cleaning is a most important part for home. We are leading in cleaning industries and also leading custom home builders Adelaide. Great information… Domestic oven detailers are premium over cleaners in Melbourne offering affordable oven & BBQ cleaning by trained professionals.